TENKARA - It's never too late! 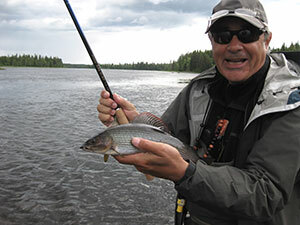 Basically it consist of fishing with one or more wet flies or a nymph. Easy movements enable anyone to fish with success, also those who have never tried before, like ladies and kids! 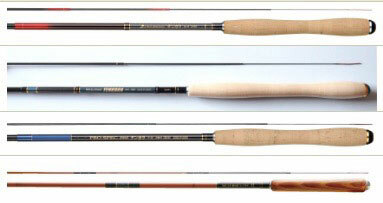 Rods finish and lightness; Wooden Spools & Rod Case; etc. 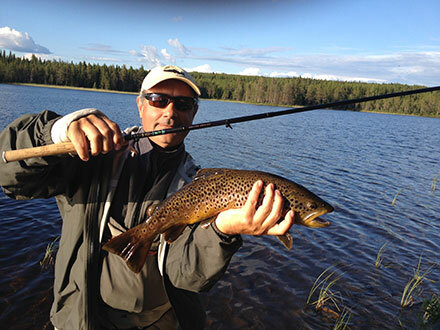 Probably, without these two happenings, I would never have approached this amazing technique...especially after having practiced fly fishing over 45 years, displayed my personal fly casting technique in many countries and guided anglers on Swedish waters since 2000! 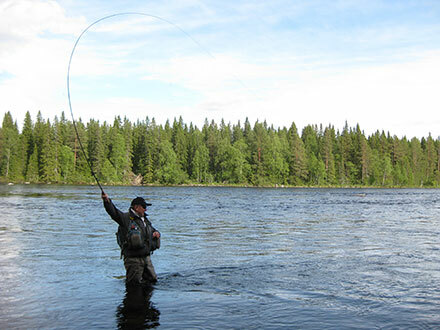 Anyway, last June, just 20 days after the accident that had occurred to my wrist, I was hosting a group of Swiss anglers and I decided to take them on the Harkan River to fish a spot that is particularly good when the water levels are medium- high, like they were at the time. After a couple of hours of good fishing, Fausto decided to switch from fly fishing to Tenkara. PL - "Progressive Lines" is a brand of Piero Letizia (more details on the web: www.afcs-flyfishing.com Equipment - Specifically for dry fly fishing, a must is to use fly lines Type DTF - weight range from #0 - 3. Technique - Based on "Progressive Lines & Easy Casting" - right balance between weights (line and leader) and rod power - progressive appliance of power on a wide and straight plane with progressive acceleration in order to generate complex fly presentation schemes - present the fly following a precise sequence: 1) Fly 2) Leader 3) Line While he was setting up the equipment, he told me about his one and half year's experience with Tenkara on small waters only, using traditional approaches, but he admitted that he had not fished big waters like Swedish rivers yet. Finally the equipment was ready: Tenkara rod: lenght mt 3.60 action 7:3 Line: braided leader mt 4,00 Tippet: cm 80 smaller sizes Fly: Dry - a special pattern At his first cast, I immediately noticed that there was something wrong in his approach and after a very short reasoning I asked him why he was using such a short tippet. His answer was: this is a standard technique! Well, my first reaction was a little brisk and I persuaded him to replace his short tippet with a standard mono leader 9ft - 2x and an additional longer mt.1,5 tippet made of different decreasing line sizes. The end result was a total "fishing operating range" of 12,80 mt., including the length of a human arm. 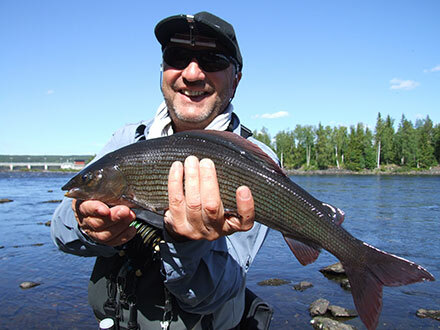 Despite Fausto's initial complaints about the lenght of the line, something happened shortly: he caught his first nice grayling on a big Swedish river! I'm a "professional guide", I laughed, then seriously I explained him that on big rivers a combination of long leader/tipper should be preferred to eliminate drag on the water. After having released his catch, Fausto lit a cigarette and let me try his rod. In spite of my wrist injury, which had sadly stopped me from fishing until that day, I immediately sensed the lightness of the rod which gave me new hope to continue fishing for the rest of the season! And after a few casts, I had my first grayling on a Tenkara rod! What an amazing feeling, especially the fighting action of the fish mostly played by hand! All I can say is, it was exciting! Fish released, I tried again and, while Fausto was joyfully smiling at me, I caught another fish. Great, awesome, unbelievable! I returned the rod to Fausto and I said to him: "My dear friend, you have given me the opportunity to explore a new world! Back home, we need to make a few more changes to your equipment for tomorrow's fishing trip! That evening, as promised, before preparing dinner for my guests at the lodge, I examined some old fly lines I had stored over the years. Once found an appropriate DT3 I cut the two endings and made two shorter lines of 6 and 7 meters in lenght. Fausto, who was impressed by the first modifications on the river earlier during the day, this time seemed a little more skeptical of my further implementations and timidly asked if he could use a 4 meter fly line the following day. I agreed, but I made him promise he would try the six meter line first. Well the next fishing day was superlative and we caught many good fish, both graylings and trouts! By the end of the day, Fausto was so enthusiastic and thanked me sincerely for having changed his approach to the Tenkara technique. The following days I practiced more and more with Tenkara in combination with my personal Fly Fishing technique. The results were incredibly successful, not only in terms of fly presentation, but in terms of general fishing experience. Let me say, the new "TENKARA" age is starting now! So, now I'm ready to reach for Argentina next week and visit Marco Bellucci, who recently has fallen victim to the contagious TENKARA, and this time of course without packing my standard Fly Fishing equipment. It's time to make new experiments and get back to you with the latest news! Follow us on the net, we are going to update our programs soon and these will include Tenkara PL School and several fishing trips dedicated to this amazing technique! Special thanks to Alberto Salvini, who supported me with technical suggestions and premium Japanese materials which allowed me to improve the TENKARA technique during the whole season and bring me back to "BASICS" ! Please respect the copyright regulations and do not copy any materials from this or any other of the pages in the Rackelhanen Flyfishing Magazine. Â© Rackelhanen 2018 If you have any comments or questions about the magazine, feel free to contact us. Please excuse us if you find misspelled words or any other grammatical errors. We will be grateful if you contact us about the errors you find.